Never have I ever... Had too much to eat...? Pause. How would you answer? I’m assuming if this was a drinking game, everyone would be taking a swig right about now. We all have eaten too much at some point. Unfortunately, I think my answer to this question would be yes way too often. Between weekends, holidays, and traveling, I can't seem to get away from food. There just always seems to be a really good excuse to eat! However, there usually comes a time when I need to bring myself back down to reality of health, wellness, and quite frankly, weight. I finally decided last year, after weekends and weekends of constant travel and bad food, that my body was feeling off. I was feeling sluggish and heavy. Bad food can do that to you. Even if you haven't necessarily gained weight, it's inevitable to eventually start feeling gross on the inside. I've said it once and I will say it again and again, there is absolutely nothing wrong with bad food - fried everything, bread, pasta, cheese covered goodness - but only over a short period of time and only in moderation. Last year, I went through a whirlwind of these foods and just kept eating them. I had the holidays to blame as well as a lot of travel, but I finally decided to do something I had never done before: a cleanse. For about two weeks I drank juice, smoothies, ate small meals, and made this detox soup recipe my go-to. It got me right back on track to feeling good! I still splurge on the weekends, holidays, special occasions, and travel, which is probably still too much, but when I'm feeling sluggish and like I've had more than enough food than my body can take, I turn to this soup as my “detox.” It’s simple, clean, and full of veggies. 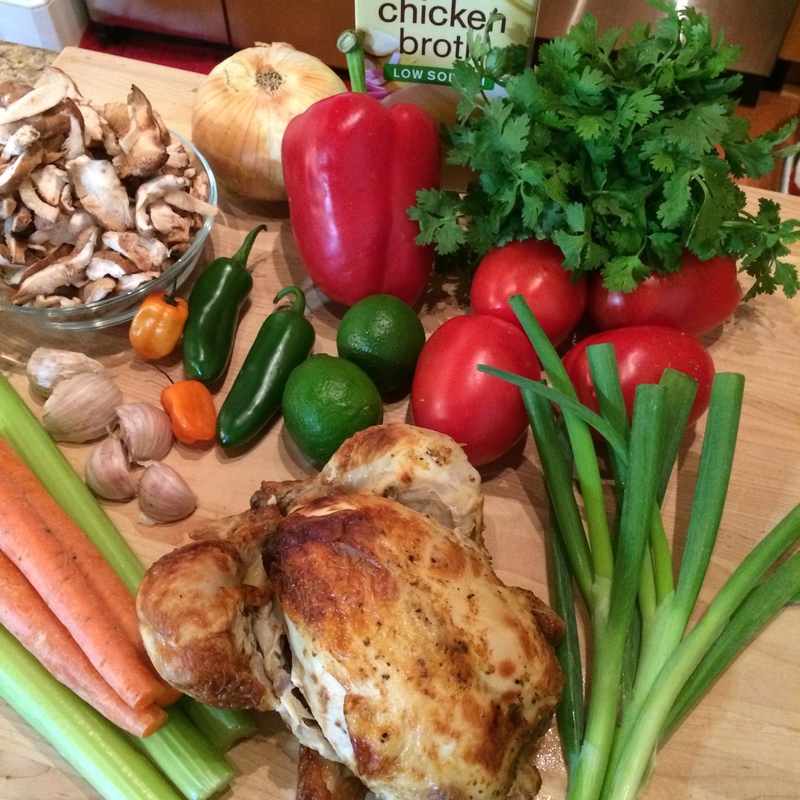 This recipe in particular reminds me of one of my favorite food items and still one of my best food memories ever – Sopa De Pollo at Mexican restaurants with my family. As far back as I can remember, my family’s go-to restaurants have been Mexican joints. It’s simply one of our favorite foods. I can remember eating Mexican food sometimes a few times a week just because we liked it so much. When Tres and I started dating, he told me Mexican was his least favorite type of food... CRUSHING! However, he has warmed up to it, and when he’s traveling, which he does extremely often, I just meet my parents and we go eat Mexican food. It’s become quality time I spend with my parents, and I always look forward to it. We always order Sopa De Pollo, and if you have never had it at a Mexican restaurant, you should order it next time. It’s the best soup ever! This recipe is my “detox” version of it, and each spoonful reminds me of all the fun times I’ve had with my family over bowls of delicious soup! In a large stockpot, throw in the celery, carrots, yellow onion, cilantro, bell pepper, jalapenos, habaneros, garlic cloves, bay leaves, peppercorns, cumin seeds, oregano, salt, chicken broth, water, lime juice, and skin from the rotisserie chicken and stir. Bring the soup to a boil and simmer uncovered for at least one hour. Strain the veggies and spices from the broth. Return the broth to the stockpot over medium-low heat. If you wish, you can reserve some of the veggies and add them to the broth. I like the peppers, celery, and carrots, so I add about half back into my soup. Just make sure you don’t bring any of the chicken skin, garlic cloves, peppercorns, or cumin seeds back in there. Add the chicken breast pieces, tomatoes, and green onions. Let heat for about 1 minute. Taste to make sure the salt seasoning is to your liking. 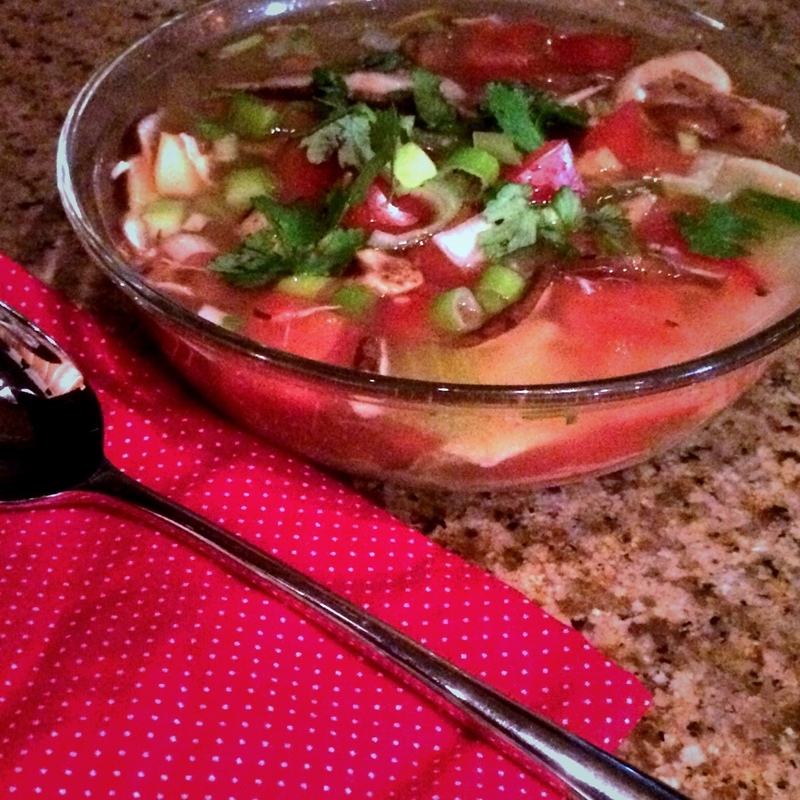 Ladle the soup into serving bowls and top with cilantro and avocado. *** You can refrigerate this soup for several days or freeze it for up to 3 months. I freeze in small, one portion containers and just reheat it with whatever protein and veggies I have around the house (chicken, turkey, mushrooms, spinach, kale, tomatoes, etc) whenever I need a quick, healthy lunch or dinner.